St John's Wort Dosage - What Is The Right Amount? What is the right St John’s Wort dosage? The answer depends on a patient’s tolerance for the herb and other factors such as age and body weight. A normal adult dose of this herb is 300 mg taken three times daily after a trial period. This is one of the best herbs for depression treatment, and clinical trials and studies have shown the effectiveness of the herb when used as directed. An ideal St John’s Wort dosage for children when advised by a physician is 300 mg per day total, and teens should take a maximum of 600 mg per day. Smaller adults may choose to take 600 mg a day instead of 900 mg as well. The possibility of St John’s Wort side effects may be higher with a higher daily dose of the herb, and many physicians suggest starting out with a single 300 mg dose per day. This allows any side effects or possible reactions to be observed at a lower dose, so that they may be less severe. If this St John’s Wort dosage does not cause any problems, then the dose can be increased up to a maximum of 900 mg per day unless otherwise directed a medical professional. 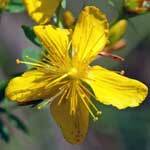 This will provide all of the St John’s Wort benefits without excessively high risks. The concentration of the supplement used will also help determine the correct St John’s Wort dosage, because a typical dose is calculated using a supplement that contains 0.3% of hypericin. If this is not the concentration used, then the dosage may have to be adjusted for this fact. Some individuals may require 1200 mg per day for severe depression and may also use St John’s Wort oil as well. The use of this herb or any other should be discussed with a physician to prevent any risks or possible interactions.